Link: picturephoning.com: Generate 360� panoramas with a mobile phone. Link: Your audience knows more than you | The News is NowPublic.com. Link: Mass. home sales slide 11% in a year – The Boston Globe – Boston.com – Business. ”We’ve got a flashing yellow light," Bill Wendel, owner of the Real Estate Cafe in Cambridge, said about April and May sales. ”Supply is going up, demand is going down, and we’re still at record-low interest rates. When these rates go up," he said, ”sellers are going to have trouble." James Fallows on NPR’s MarketPlace. If you had to imagine on thing beginning the chain of dominos, it’s the dollar. What’s holding it up, is a sense by the Chinese that they have to subsidize our buying power to keep things going. When the dollar falls, then suddenly, people cannot sell their houses. Then you have this cycle. for clients who they too often sell short. Illusion is going to be extra strong." 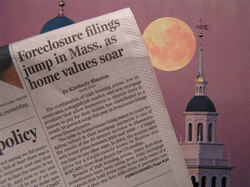 market has peaked, and the Boston Globe’s recent series of headlines on foreclosures haven’t already freaked them out, what do you bet that history will recognize this year’s summer solstice as a celestial tipping point in hindsight? Link: Dog Days of Summer. Over the course of the past hundred years, the average life expectancy has gone from forty-something to seventy-something. Baby boomers are now envisioning 85 to 100 year life span, and many of us are wondering if we can afford not to work, and whether that would be an interesting lifestyle. The average retiree watches 43 hours of TV per week! Retirement was started in the ’30’s not to create a leisure class, but because 25% of young people were unemployed. Retirement allowed younger workers to replace older workers, and to begin their economic lives. That condition no longer exists, so the nature of retirement is changing. Employers will begin to create more flexible forms of retirement so people can continue to work part-time. 50 and 60 year old will begin to retrain themselves and start whole new careers. Lots of people up and down the ladder to contribute to society. Comparing the U.S. to other countries, Americans are most likely to be involved in financial considerations, and second least likely to expect their children to care for them in retirement. Our "do-it-for-yourself" culture is motivating people to provide for themselves. Sign of the times or self-fulfilling prophecy?